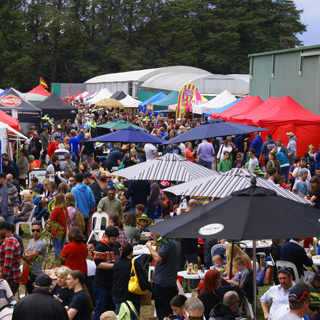 The Herb and Chilli Festival 16-17 March, 2019 - Australia's hottest weekend! 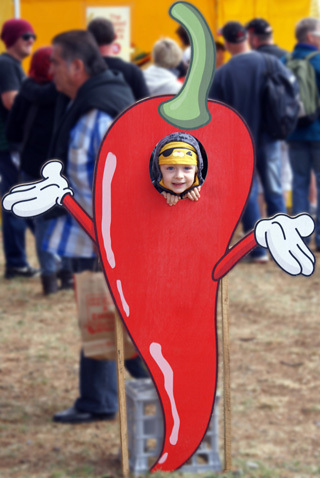 Welcome to the Herb and Chilli Festival, 2019. This year is ramping up to be the best one yet and we’re looking forward to welcoming the crowds! With plenty of your favourite stall holders returning and a number of exciting new additions, expect an abundance of sumptuous food, lively music and sensational entertainment to suit every age. With free entry for kids under 14, the bigger-than-Ben-Hur Free KidZone is definitely going to get a workout! Hot Sauce Alley is bound to be hit again this year, with many new sauces, relishes and rubs being released at the festival, while the popular Stinger Wing Challenge will no doubt see plenty of victims willing to set their mouths on fire (metaphorically speaking, of course!) for fame and glory. Keen to try growing your own chillies or herbs at home? We’ll have 40+ varieties of chillies and a massive range of herbs for sale. Chillies were propagated in September last year and are looking fabulous. Tickets available at the gate OR online through TryBooking.com – click on the 2019 Festival Ticket tab above. Buy tickets online and receive a free Herb & Chilli Festival hat and, most importantly, avoid the gate queues! For discounted group bookings (10+) call Clive on 97353831. Like us on Facebook to keep up-to-date with what’s on at the festival. Tickets: Online (best option if you want to bypass the queues) or at the gate on the day. Weekend passes also available. Festival: Adults $24; Concession/Students $18; Children under 14 FREE; Family (2 adults, 2 under 18s) $65. Disabled Access: Level site with no stairs and dedicated parking area. Parking: Free on-site or nearby. Separate parking area for motorcycles and bicycles. All-inclusive: Vegan and most other food options available. Huge KidZone. Well-behaved dogs welcome on leash. Everyone receives a free Herb and Chilli Festival book and program. Everyone receives a free online Herb/Chilli Growing course (TBC). Every ticket holder receives a free plant. Four stages running from 11am to 4.30pm both days. (Speakers, Cooking Demonstrations and Entertainment). Free kids’ activities including Jumping Castles, Face Painting, Pony Rides, Animal Farm! 80+ stalls selling sweet and savoury foods, beer, wine and healthy drinks, handicrafts and other products. Reasonable prices (most food dishes under $10 and most drinks at standard bar prices). Access to the world's best hot sauces - Australian, American, Mexican and Japanese. On the Saturday night come and hear one of Australia's greatest entertainers. With a music history going back to the amazing sixties Normie Rowe has been at the cutting edge of Australian pop music. Songs like It Ain't Necessarily So, Que Sera Sera and Shakin' All Over are recognised by music lovers young and old. Normie will be playing in our first Hot Summer Night concert from 7pm until 10pm. Tickets on sale at TryBooking.com or at the gate. Tickets are for stand alone concert or as part of a package with Festival and Concert. Go to the 2019 Festival Tickets page for full pricing details. Concert only tickets are $30 on line and $35 at the gate. Normie starts at 7pm but concert ticket holders can enter the festival from 4.30pm. 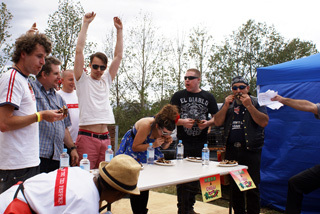 The Australian Chilli Cookoff is back for 2019! Hot Sauce Alley will again be a feature of the event! Festival Favorites. Have a wander and test your tolerance. Check out the difference between the Ferraris, Mazeratis and Rolls Royces of Hot Sauces. - Flamin Good Chilli: Chilli Sauces, salts, oils, & world's hottest dimmies. - The Patch on the Bellarine:.Home made chilli jams, chilli sauces, relishs and chutneys. - Diemens Hot Sauces: Hot stuff made using the Tasmanian Pepper Berry. - Grumpy Gary's Hot Sauces: Handcrafted sauces that are a bit milder, but still hot and tasty. - Jungle Rain: Gourmet Chilli Sauces featuring Sadistic Slumber and Jungle Mustard. - Blonde Chilli: Best range of imported sauces including Blair's Death Sauce, HellFire, and more. 2000 square metres with over 20 food vendors showing off food styles from all over the world. Come and sit down, listen to some music and try food from all styles many of which are hard to find in Melbourne's amazing restaurant scene. Selection of expert speakers covering a broad range of topics, including growing and using herbs, chillies and other edibles at home. Get your groove on and your toes tapping at the Entertainment Stage! MC’d by local muso Garry Marr. Includes our regular Peruvian Folkloric Peruvian dancers and Inka marka with their amazing Andean music. Garry and John play a mixture of music; blues, jazz country and pop, from the seventies till now. They have played and sung with many musicians and toured in most states of Australia and overseas. They have also had tv and radio appearances with their original music. Tired of cooking up the same old stuff at home? Want to zhoosh up your meals repertoire? Come along and watch our chefs and cooks whip up their favourite dishes, explaining as they go. Whether you’re keen to set your mouth on fire, or would prefer to simply watch all the fun, the Competition Stage is where to see the heats and finals, including the Stinger Wing Challenge and Captain Chilli. This is also where you’ll be enthralled by the spectacular Lucha Fantasica Mexican wrestling. Australian Chilli Cook Off - Teams competition to make the yummiest chilli dish - register your interest through the link above. Stinger Wing Challenge: Chicken wing eating competition run by Diemen's Hot Sauce. Shot n Holler: Knock back a shot of tequila and chilli sauce, then Holler. Loudest wins! Captain Chilli A test of endurance with the winner consuming the most hottest food items in the quickest time. A challenge for the strong! The Herb and Chilli Festival Exhibitor Awards: Best Relish. Best Hot Sauce. Best Stand for the most colourful and exciting stand. Our huge KidZone will keep the young ones (and young at heart) entertained for hours. Including a HUGE jumping castle for big kids and small one for little kids, pony rides, face painting, petting zoo and photo points! Click on the image below to watch the Better Homes and Gardens visit to the Herb &Chilli Festival 2015.